Nite Ize - S-Biner MicroLock --- The Nite Ize S-Biner MicroLock is a great accessory for holding, organizing and identifiying keys or other small items. Features a center locking lever, stainless steel wire gates and a tough polycarbonate body. In other words: the Nite Ize S-Biner MicroLockcuts no corners when it comes to intelligent design. The simple twist-to- lock lever keeps items steadfastly in place, making this S-Biner as versatile and convenient as it is secure. 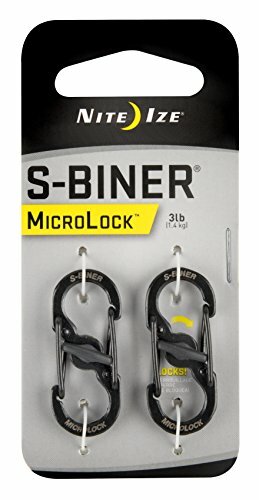 Nite Ize S-Biner MicroLock holds up to three keys, measures .618" x 1.406" x .138" (15.7mm x 35.7mm x 3.5mm), and weighs .07 oz (2g). Nite Ize has been creating innovative, solution-based products with quality, performance and value at the core for over 25 years. Based in Boulder, Colorado, we aim to continue offering imaginative and innovative products that make our customers lives easier, safer and more fun. Cartman tie down, be made from Poly Ethylene material, much more strong then normal Propene Polymer belt in market. Iconikal Utility Straps with Buckles are a perfect tool for cinching down sleeping bags, backpacks, tents, bikes, car loads, and more! 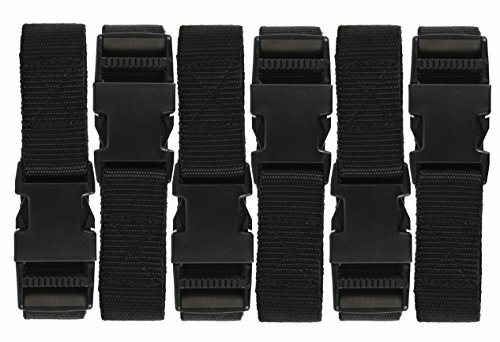 Quick-release buckle is convenient to use and quickly adjusts to desired length. Is 72 inches (1.8m) too long? Simply cut to desired length and seal fray with a match or lighter. Strong polypropylene straps will hold well. Strap measures 15/16" wide. Includes (6) straps with buckles. 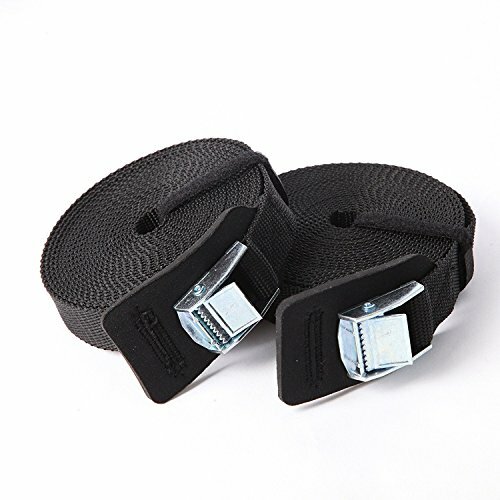 Ozark Trail utility straps with buckles are a perfect tool for cinching down sleeping bags, backpacks, tents, bikes, car loads, and more quickrelease buckle is convenient to use and quickly adjusts to desired length. Is 72 inches (1.8m) too long? Simply cut to desired length and seal fray with a match or lighter. Strong polypropylene straps will hold well. Strap measures 15/16" wide. Includes (4) straps with buckles. Keeper Performance Engineered Slings are made from Hi-Test webbing and meet WSTDA standards. These polyester web slings with flat eye to eye loop ends are versatile slings for general use. Use in choker, basket or vertical hitches. Heavy duty fabric covered loop ends are more durable. Tapered eyes are standard on slings over 3" wide. The 2", 1 Ply slings have vertical/choker/basket capacities of 3100lb/2480lb/6200lb and have a Class 7 rating that uses 20,000lb webbing (9,800lb webbing per inch width minimum). 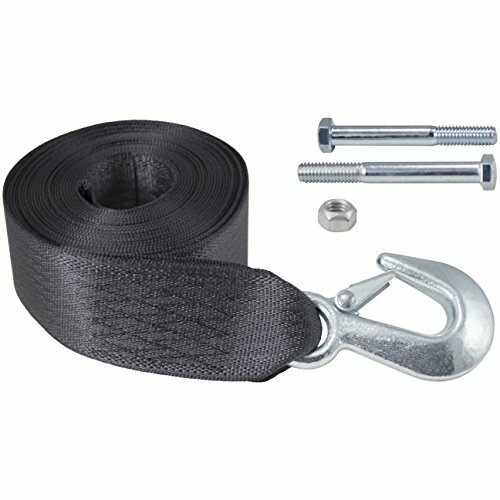 This Keeper lashing strap is typically used for securing canoes and kayaks on the roof rack. This pro grade lashing strap has a 200 lb. working load limit and 600 lb. break strength. Keeper is the expert and leader in branded products and services people trust to ensure their personal property is reliably secured, transported, and stored. These well engineered products are the most trusted to provide unique, simple solutions for specific everyday needs, offering reliability, security, safety, and ease of use. The kit includes : One 54 inch nylon webbing. 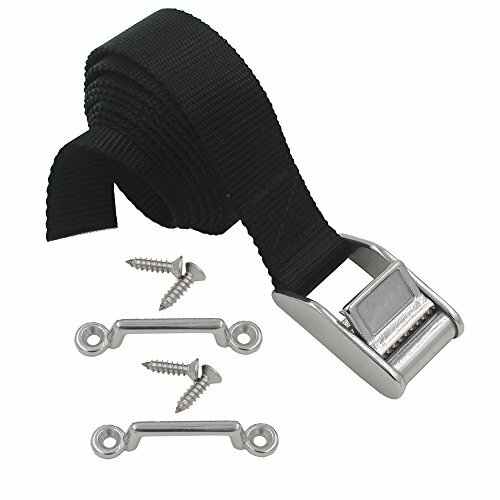 and one stainless steel 316 buckle , 2 stainless steel 316 eye strap mounts , 4 SS screws . Material : The webbing is made of heavy duty nylon , UV - resistant . The buckle and the eye strap mounts are made of stainless steel 316. Last for years. 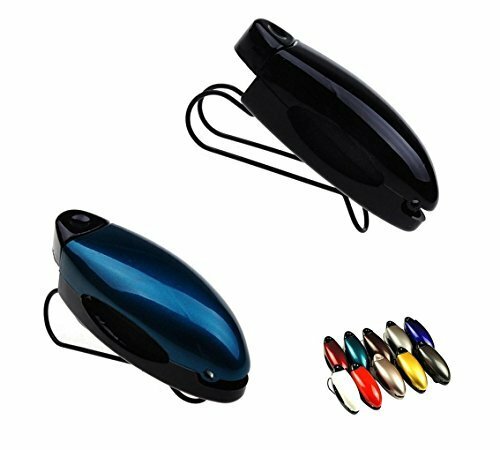 Suitable for Boat Marine RV auto trainer use. Ideal for securing battery boxes and other equipment. Slightly longer 2" x 20 foot size, for applications where a little extra length is needed. For use on winches up to 2600 lb capacity. Mounting bolt and locknut included. 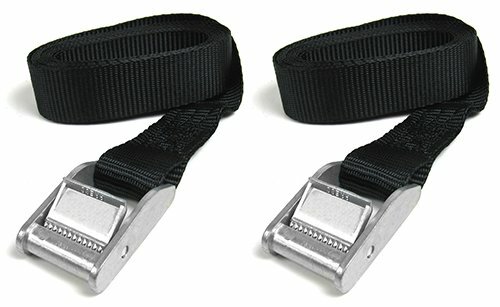 Boncas cam buckle tie down straps is 16 feet long, 1 inch wide, includ 2 packs to meet your needs. 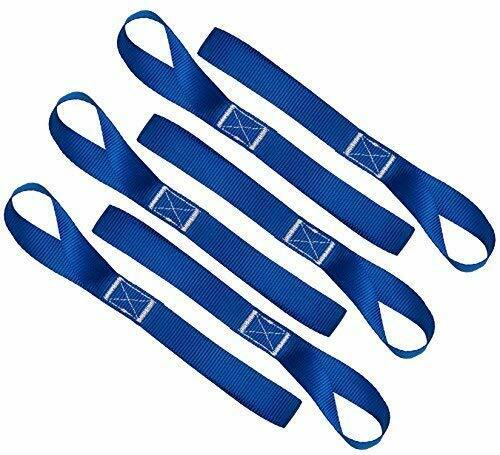 Cam straps with delicate gear and sturdy thick strap, they grip well and work strength 100lbs, break strength 300lbs. Commonly used outdoor equipment, used for car roof rack cargo tie down, kayak canoe SUP surfboard tie down, boat trailer tow strap, luggage strap, joining beds, car roof strap for roof top carrier. Lashing Straps with good size and thickness foam pad, special design for protecting your vehicle and cargo. Easy storage with help of fastening cable, keeping the cam straps well organized and tidy in place. Easy to use. 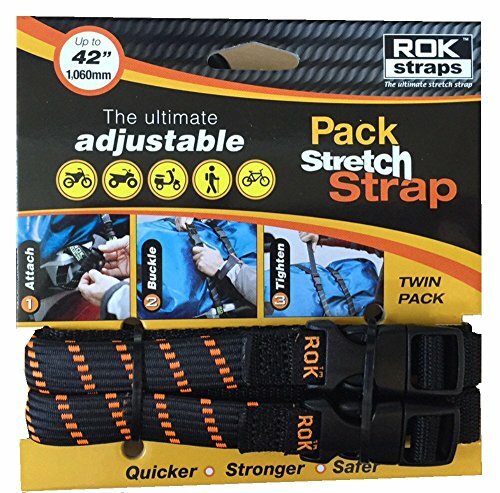 The straps with a suitable length (16 feet), it can be adjusted and meet a variety of strapping needs. If it's too long, just tie the surplus cord into a knot so it doesn't bang against your car. Use Camco retractable Transom tie down straps to safely secure your boat when traveling. Has easy to use hooks on each end and the retractable straps have an easy ratcheting mechanism. - Size: 1 Ft. x 1 In. Why do you need soft loops and how do they work? Soft loops protect motorcycles, ATV, snowmobiles, UTV, mobility, lawn/garden equipment frames & more when using hook end tie-down straps. Your vehicles or equipment are less likely to move during travel with a larger contact surface area and will prevent vehicle frames from being scratched. They are incredibly easy to use! Our soft loops are designed to work with Ratchet Straps or any other type of tie down that you are using. They wrap around the handlebars or frame of your equipment to create a larger, more secure point where hook tie down ends can be attached, further stabilizing your tie down system. They can be used to either loop, or create a slip knot, at any appropriate attachment point of your recreational vehicle or other type of equipment. Each strap loops around and inside itself to create an instant soft tie-down point for attaching J-hook and S-hook tie-down straps. This accessory makes securing easier and prevents scratching of your paint or chrome in transport. Keep your equipment safe, secure and in pristine condition with AUGO's Soft Loops! At AUGO we take pride in providing top quality products. If for any reason you are not pleased with your purchase, contact a customer care representative so we can be of assistance. TOP QUALITY CONSTRUCTION: Our heavy duty soft loop tie down straps are very durable for long-lasting performance, and have an impressive 1,500 lb. capacity with a 4,500 lb. break strength! 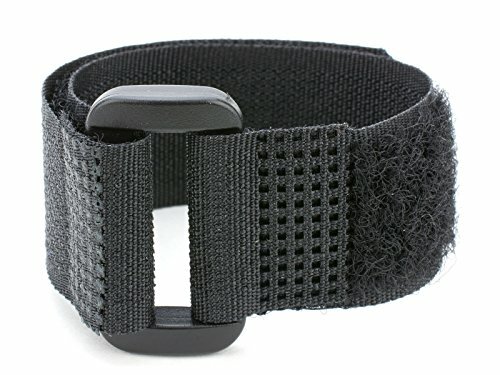 MULTIPLE USES: Use our tie down soft loop strap to secure ATV, UTV, motorcycles, scooters, dirt bikes, wheelchairs, lawn/garden equipment & work with any type of tie down you are using. SECURE YOUR VEHICLES & EQUIPMENT: These quality loops help to preserve the condition of your vehicles & equipment by keeping them secure, in place & prevents the scratching of paint. EASY TO USE: These soft loops are a easy to use by creating a slipknot or loop with any tie down. Simply cinch the soft loop and hook the tie-down to it instead of a bare equipment frame. 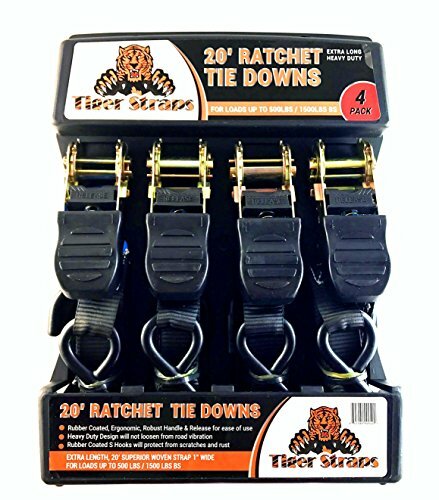 6 PACK: Get more bang for your buck with this 6 pack of tie downs that you can keep on hand for when you need them. You can also use more than one tie down to secure a larger load. Great for protecting edges, cargo racks, skating rinks and so on. TonsLift Professional Moving System was designed to make your relocation easy. It doesn't matter if you are a professional moving helper or a private person, TonsLift Professional Moving System will assist you in carrying heavy things. Thanks to durable straps, buckles with a load capacity of MAX. 5000 lbs and a special vest, this System increases the comfort during relocation and make lifting heavy things seem effortless. 1. Put on the vest. Comfortable: TonsLift moving straps with Special vest was designed for more comfortable in moving, make moving feel like effortless. 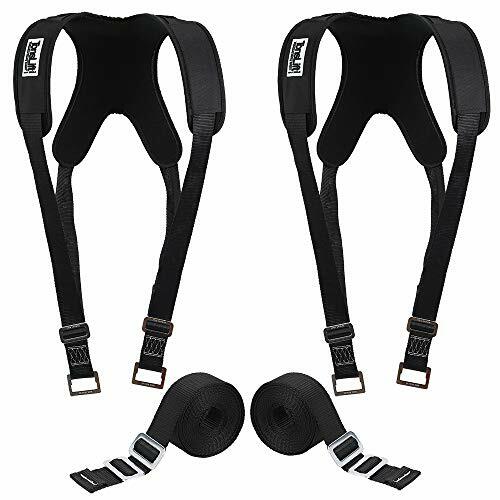 Heavy Duty: TonsLift Moving Straps have Tab Tested 5287 lb Break Strength Straps and buckle installed to ensure heavy object and safety lifting. Arm/Hand Free: TonsLift Moving Strap 2x12 feet traps to free your Arm and hand, you just need set up the Tonslift moving system, stand up and walk, it is so easy. Adjustable: TonsLift Moving Straps have adjustable and extremely easy and quick buckle can fit your hight, the size of object in short time. 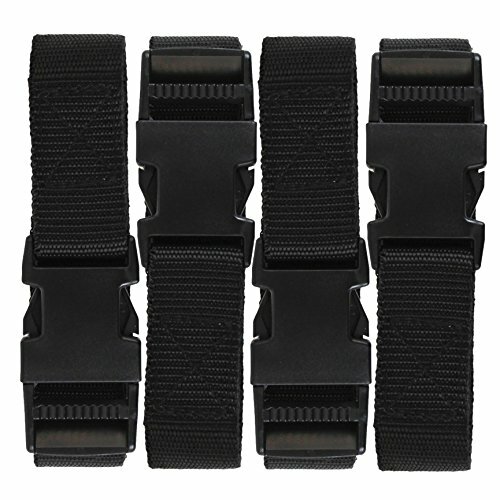 Straps are woven polypropylene with "firm-grip" buckles and are completely resistant to battery acid. Kit includes four #8, 3/4" screws and two footman clamps. Gadget Beyond Hook And Loop Cable Ties 1" x 12" Just wrap it around anything, Such as cables, Boxes, and Plants Etc. Extremely easy to use!!! Premium Quality - Parts are sewed and welded together to ensure maximum lasting performance. Multi Purpose - Our ties Can Be used for ALL of your applications!!! Package includes: 10 1 inch x 12 inch Cable Straps with super strong buckles. Try it Risk Free, We offer 30 DAY MONEY BACK GUARANTEE, NO QUESTIONS ASKED... If you are not satisfied with it, simply return it for a full refund. includes 1 Year Warranty!!! With extra-long straps 20' x 1" you will have plenty of strap to secure larger loads. Our extra strength webbing is manufactured from 100% polyester thereby guaranteeing not to stretch or hold moisture. Our tiedowns straps webbing is UV treated for direct sun durability. 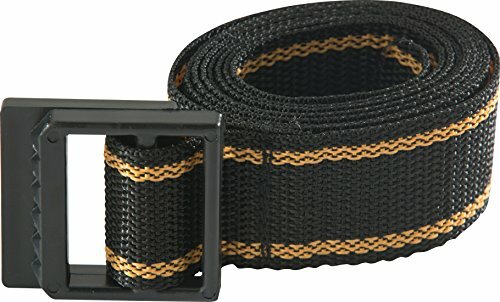 With this additional strength and with 20 feet of ratchet tie down webbing you will have plenty of uses such as motorcycles, ATVs, trailer loads, mountain bikes, building materials, snowmobiles, scooters, lawnmowers, jet skis, boats and anything else under the sun that needs to be ratchet tie down strap and secured. HEAVY DUTY AND DURABLE- our ratchet tie down offers new state-of-the-art ERGONOMIC molded custom strap handles guaranteeing your handles will not fall off. MOLDED RUBBER COATED S HOOKS- our rubber molded hooks protect your cargo and equipment from any scratches or pressure damage. Product Description: Aleko Snow Blower Chains can be installed in minutes and removed easily in snow or ice. It features low operating weight with long service life and a smooth ride for comfort. Zinc-plated for long lasting performance. Offer a smoother ride vs. four-link spaced chains. Product information: Fits Tire Size: 14 x 5. Includes: 2 Snow Blower Chains. Extra Traction For Deep Snow and Ice. Prevents drive wheels from slipping. Easy to install and remove as needed. Heavy Twist Link Design. Designed for deeper lug tires. Zinc-plated for long lasting performance. Provide added traction on hills, ice and hard packed conditions. Offer a smoother ride vs. four-link spaced chains. 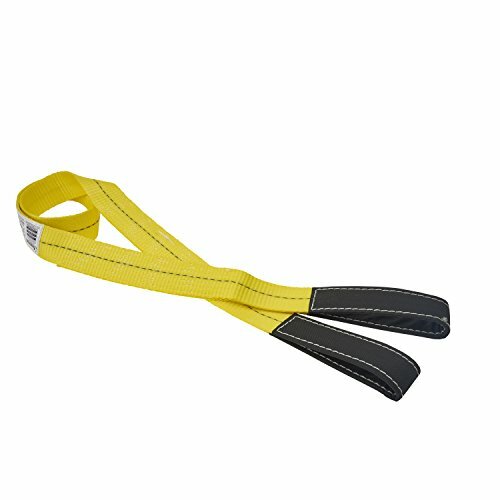 Trekassy yellow lift straps are made from industry grade polyester which is more durable and UV resistant than either nylon or polypro as well as for 10% MAX stretch while under load. 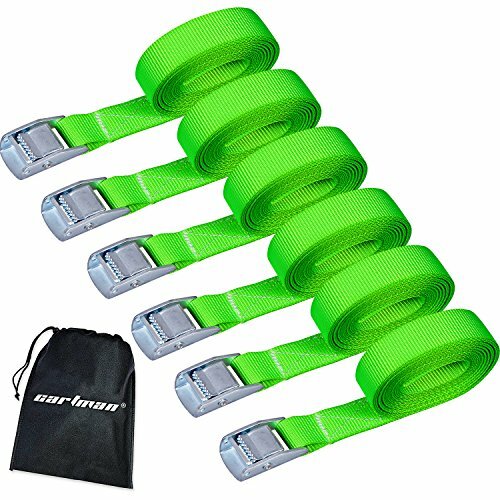 These Polyester Webbing Sling are 2 inches width straps with flat eyes at each end which offers greater surface contact to protect the load from damage. You may rest assured all our lift sling straps are meet WSTDA standards and it is safe for general use. According to the actual lifting situation encountered,there are different ways to choose and ensure the position safe throughout the complete lifting & lowering process. With vertical/choker/basket rated capacities of 3333lb/2480lb/9400lb, each polyester sling works great with chain hoist, electic crane and winches. 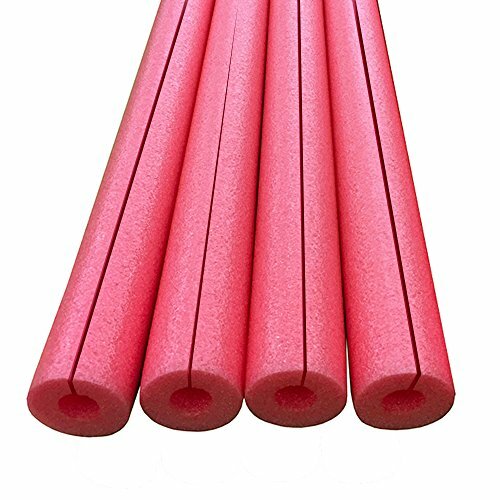 What's more, with the features of flexible and light weight, they will also offer little damage to the load to help reduce scratching and denting to loads being lifted. 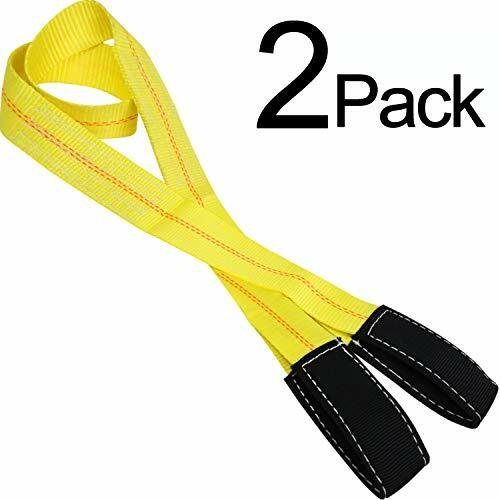 2 pack of 6' x 2" lift straps with flat loops. 100% Money Back or Replacement Guaranty. WLL mode factor- 3,333 lbs Vertical Rated Capacity, 2,480 lbs Choker Rated Capacity, 9,400 lbs Basket Rated Capacity. Durable Material- Our web sling is made from 100% polyester which have good resistance to UV radiation and won't fade. Ease of use- More flexible and lighter to be used than chains and wire ropes,never rust. Durable hoist strap- Each loop end has excellent wear property to provide more durability when attaching to shackles or over hooks.